Tolisso spent 10 years at Lyon. FRANCE MIDFIELDER CORENTIN Tolisso has moved to Bayern Munich from Lyon for a record fee that could reach €47.5 million, the Bundesliga champions announced on Wednesday. The 22-year-old signed a five-year deal with Bayern to bring an end to his 10-year association with Lyon. Before bonuses Bayern paid €41.5 million, making Tolisso the most expensive player to be signed by a Bundesliga club, breaking the previous record set when Javi Martinez joined Bayern from Athletic Bilbao in 2012. It is also Lyon’s most expensive sale, ahead of Michael Essien’s departure to Chelsea for €38 million in 2005. Tolisso, who made his senior international debut against Spain in March, had been contracted to stay at Parc OL until 2020. He impressed in the recent French season by scoring 14 goals in all competitions, a career-best tally. 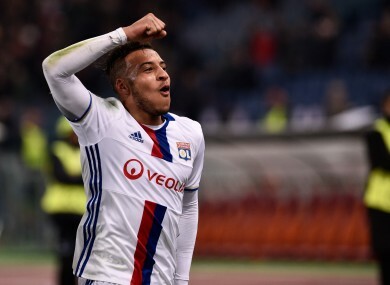 “I had a wonderful time at Lyon, and I’m very thankful for that,” Tolisso said in a statement released by his new club. Tolisso is Bayern coach Carlo Ancelotti’s most expensive signing of the close season so far after the arrival of defender Niklas Suele from Hoffenheim for €20 million, and the permanent transfer of Tolisso’s compatriot Kingsley Coman from Juventus for €21 million. The five-time European champions also paid Werder Bremen €10 million for former Arsenal winger Serge Gnabry. After the retirement of Spaniard Xabi Alonso, there is a free slot in the Bayern midfield. “We’re really pleased we’ve been able to sign such a young and interesting player ahead of stiff competition from abroad. Corentin Tolisso was Carlo Ancelotti’s wish for our midfield,” Bayern chairman Karl-Heinz Rummenigge added. Tolisso will be a big miss though for Lyon, who finished fourth in Ligue 1 to miss out on a place in the Champions League. “Corentin is an exceptional player and without doubt one of the best European midfielders, but also a man with great personality,” said Lyon president Jean-Michel Aulas. Email “Bayern break transfer record to sign French midfielder Tolisso from Lyon”. Feedback on “Bayern break transfer record to sign French midfielder Tolisso from Lyon”.